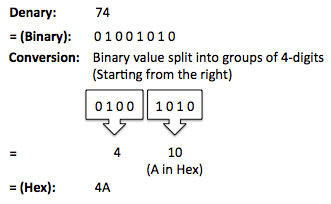 Start by showing two numbers on the board (one in binary and one in hex). Explain to students that we often find it difficult to remember long sequences of numbers so, to make life easier, we can break the number down from 4 bits (a nibble) to 1-bit. Explain that when we reach 10, we hit a problem as we can only use the numerical values 0 – 9. Ask the students to suggest ways we could represent the last 6 numbers without using numbers. Explain that when we get to 16, a 1 is added to the front of the next number (highlighting the similarity to the denary system when we go from 9 to 10). Explain that, for the exam, students are expected to be able to convert binary to hexadecimal. (a) Convert the hexadecimal number 6A to denary. (You must show your working out). Finally I explain that, also for the exam, students are expected to be able to convert binary to hexadecimal. (a) Convert the binary number 00111101 to hexadecimal. Finish by putting this all into context. Display the following table on the board and ask students if they recognise it. Ask if they can spot anything familiar (based on the lesson). Explain that #FFFFFF = 1111 1111 1111 1111 1111 1111 in Binary which is 16,777,215 in Denary which also happens to be the same number of colours in a web palette! Ask students to think what it would be like to have to use binary to change the colour of a webpage in HTML!